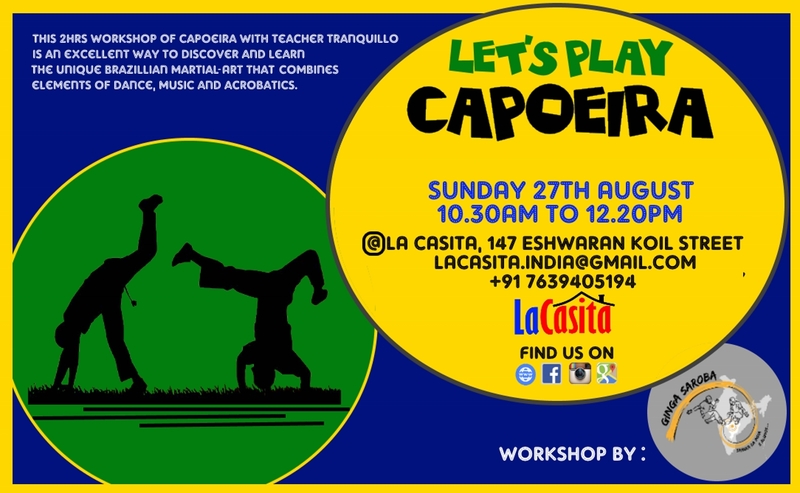 This Workshop is good for beginners to discover Capoeira and will also be beneficial for those who would like to progress in this Art form. We are open to hosting regular classes on mutually convenient schedule. Tranquilo first learned to Ginga with the group Capoeira Brazil in Pune (India). He joined the Ginga Saroba family in 2012 and helps teaching the projects since then. Teaching since 2015, he organizes classes for kids in Udhayam, a social center in the Kottakarai village. Ginga Saroba is a pioneer Capoeira group in South India. It was started by Prof. Samuka da Índia and his students, under the guidance & support of Mestre Branco (Ginga Nagô).